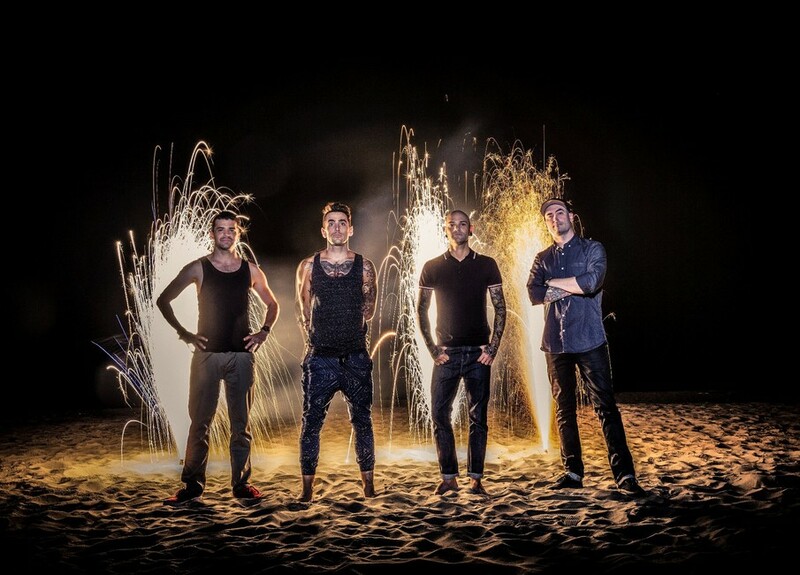 In the time since the release of their self-titled 2005 record, Vancouver pop group Hedley has weathered the ups and downs of the music business, racking up an impressive range of accomplishments along the way. The group has earned four consecutive double-platinum certifications in Canada for their debut, 2007’s Famous Last Words, The Show Must Go (2009) and 2011’s Storms, accounting for more than 800,000 records sold. In addition to a pair of Juno Awards for Pop Album Of The Year (for Storms) and Video of the Year for their single “Perfect,” the band can also lay claim to an impressive 12 MuchMusic Video Awards. Hedley returns to Moncton on Thursday evening, touring behind their fifth full-length effort, Wild Life. Produced by Hedley vocalist Jacob Hoggard and the group’s longtime creative collaborator and friend Brian Howes (Nickleback, Simple Plan), the album reflects a considerably more optimistic outlook than their previous effort Storms. Even though they are now five records into their career, Dave says that the making of the record was anything but dull. He credits Hoggard for having brought his A-game to the songs, which in turn drove the overall feeling behind the album. In a time when any music act’s success is not guaranteed from record to record, Hedley has remained a top concert draw while consistently selling records. Thanks to the loyalty of their fans, the group enjoys an almost rabid dedication to their music. And while it might sound cliché, Dave admits that Hedley would be nothing without their fans. “Everything fell in place with the band at the perfect time. We were always very social with our fans before social media like Twitter and Facebook really took off. We would play shows and would stick around after the show to talk with people. It’s humbling knowing that someone took the night off work or made plans to come see us play live. “I can’t tell you how proud I feel to be making music with the other guys in the band. We are now nine years into the band since the time of our debut record and just feel so fortunate to have had an amazing career so far. With a wealth of radio hits and album favourites to pick from, Dave notes that Hedley’s current Canadian tour, slated to wrap up on April 12 in Abbotsford, B.C., will offer a little something for new fans as well as those who have been with the group for the last decade. “It is so important to evolve the live show and push forward. As great as it is to play those audience favourites every night, it is also very exciting to be able to do something that we have never undertaken before as well. We will never take our audience for granted. We would never want to go on stage and just go through the motions every night. We consider every concert an opportunity to celebrate with a few thousand of our closest friends,” Dave says. Although Hedley has enjoyed an enviable track record in Canada, Dave says the group is also looking forward to the opportunity to take their music outside the Great White North. To that effect, Wild Life is being released in the United States, United Kingdom, France, Germany and Australia, literally opening up a world of new Hedley fans to be made.